But this post is not to sling arrows about what used to be. This post is to lament the demise of some great spots for bargain shopping with which Boston used to abound. The bargains made it possible to live well and fashionably on a budget. 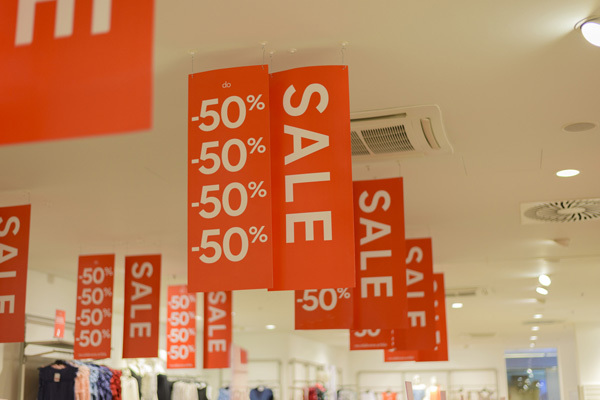 In those days, bargain shopping meant deals on better made, higher-end merchandise that was marked down rather than what we have in many off-price stores today – merchandise that was made cheaply to sell cheaply. Filene’s Basement – I miss the original, downtown basement. None of its other iterations compare. The hole in my heart at its demise is nearly as large as the crater left downtown after the developer tore down the building without, it turns out, having the money in hand to get it quickly rebuilt. Bradlees – I used to enjoy shopping at the Bradlees stores in Field’s Corner and on Morrissey Boulevard. I could always get what I needed at a bargain. Their merchandise was more well-designed than Zayre’s and other discount department stores. They had a bit of a Target vibe. The Bargain Center in Quincy – I miss, miss, miss this store, called Quincy Bargain Center by me and my friends. It was the absolute best. I outfitted my children in brightly-colored Oshkosh B’Gosh overalls with matching turtlenecks from QBC. In addition to clothes, I bought a sofa and loveseat set as well as three well-made, designer parsons tables out of burlwood that I still own to this day. Hoffman’s – located in the same mall as the Bldg. 19 in Hingham, it’s merchandise was more expensive and very well made. Stride Ride Factory Outlet on Harrison Ave. – Shoes for the kids and family. Harry the Greek’s – a little bit of this and that – shoes, t-shirts, pants, etc. Robell’s Department Store – I shopped at the store in Dudley Square not feeling comfortable going to the South Boston site. You could find anything there. Bow ties for a son’s suit. Tights in all sorts of colors. A red dish drain set to go with my red kitchen counters when I lived on Elm Hill Park. I had looked everywhere for red which was not as ubiquitous a color for house wares as it is now. I finally went to the basement of Robell’s, and there it was. Lechmere Sales – I remember buying dishes and appliances there. Jordan Marsh – especially for the Dollar Day sales. Lane Bryant – the downtown Boston store with multiple floors meant that a big girl like me could dress fashionably. They had everything – clothes, lingerie, coats, shoes. Woolworth’s –the Woolworth’s store in downtown Boston was the largest I’d ever seen. I first went there to buy stuff for my dorm room when I first moved to Boston. I also enjoyed the one at Dudley, which still had the lunch counter, and the one in Field’s Corner. I happened to walk through Faneuil Hall a couple of weeks ago and was struck by all of the national chain stores in that area. What a lack of retail variety, individuality and imagination exists in the U.S. today (and for some time). I am bored by the sameness – city to city. We eat the same things in the food courts. We buy the same fashions from the same stores. The mall owners. Except for the weather, most of the locations look vastly the same. This homogenization of stores in the U.S. is deadening. Oh, well. Can’t change the past or the passing of great shops. Holler if you hear me. Hit me if I’ve missed one of your former favorites. I especially miss Bradlees and Woolworth’s. They had all kinds of things like replacements for the rubber feet on metal chairs and an amazing variety of curtain rods. I miss the original Filene’s Basement store in Downtown Crossing. The atmosphere was electric and so were the shoppers; they knew what they wanted and went after it–and you if you were holding what they wanted–with passion. You got great stuff for short money. The value was incredible. Filene’s Basement in Downtown Crossing was a treasure! I miss Filene’s Basement downtown especially when they would have the $16.00 dress sale every April.My cousin and I would go downtown and rack up on dresses.Then there was the $99.00 bridal gowns that would have shoppers bumrushing the store as soon as they opened. Those were the days!!!!! I miss the dress sales, too. I missed the markdowns and waiting and watching for an item to go down. I used to find Friday evenings after work a great time to go. Thanks for leaving a comment. Don’t forget about Blair’s supermarket on Washington Street down Dudley. Do you remember Freddie Parkers? I do remember Blair’s and Freddy Parkers but never really went to them because I didn’t grow up here. I did go to RObell’s, Kims Kaps and the recently closed Royce Shop. I miss them a lot. Thanks fro taking time to leave a comment. I guess I didn’t include because Stop n Shop is still around. Thanks for commenting. ← Do you know where your high school yearbook is?